NEW! Advanced Non-Surgical Grafts Now Available! 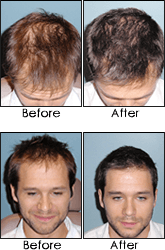 The Advanced Non-Surgical Graft is a much faster and far less expensive alternative to traditional hair surgeries. 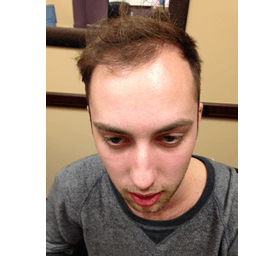 This procedure will leave you with a beautiful, full head of hair, with no surgery necessary. Our team will add hair in away that you can style your hair any way that you want, completely blending it in with your existing hair for a seamless integration. You have the option of having hair gradually added back to the scalp over a period of time, as to not draw attention from others, or replace as much as you want all at once. The way we achieve a completely natural looking style is with an extensive process in which we first determine where the hair needs to be added to give you the perfect style, density, and volume. Our hair professionals will then add hair back into a synthetic type skin that is formed to match the hair loss area, ensuring that it is placed in the exact angle and direction of your natural hair growth. This attention to detail will ensure a virtually undetectable blend with your own hair, designed to match the balding and thinning areas of your scalp. No matter how close you get, you will not notice our Advanced Non-Surgical Graft. Once your hair is added, one of our expert hair stylists will then cut and style your hair to give it the optimal look and feel. The bottom line, we want to make you look even better than you did before. Our stylists are skilled in matching the perfect hair look to your age and structure, giving you a look that will make heads turn.